Good ones. In the keyfob post people who were more knowledgeable mentioned how the embargo was set for a specific time period and then expired and GM either forgot or couldn't extend it. I have NEVER seen a major product development project where the original internal timeline was actually met. Internal timelines are set very aggressively to keep people moving as quickly as possible. It is normal practice to set internal timelines with a significant probability they won't be met due to testing results, but to not make public promises until you know you can deliver. That distinction is important. I've spent my entire career in the aviation business, and not a single commercial aircraft has ever been finished by the manufacturer's original internal timeline going back 40 years. Folks here are only focused upon the new ME, but it is the norm on virtually every major new project, especially when you're making a complete paradigm shift such as going FE to ME. 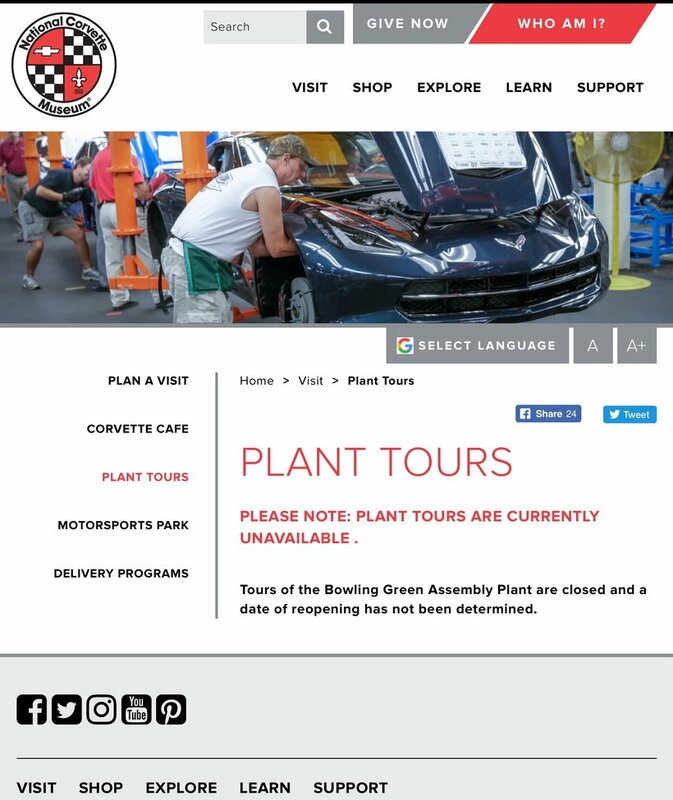 I can assure you that GM is not losing any sleep over NCM's failed promise to resume their sponsored plant tours by 1/2019. I'd chalk that up to NCM making a mistake by naming a date when they'd continue. Last edited by Foosh; 02-22-2019 at 10:23 AM. I'm not criticizing GM at all... I'd much rather them execute well vs. on-time. I'm just pointing out that the car is behind schedule in a material way. For the C7 they made a huge deal about 01.13.13 in all the teasers etc. They set a goal/date and met it. I'm just hoping they start really teasing the car soon. I loved the C7 release videos. I seriously doubt the C7 was any different. The original internal timeline was probably well before 1/13/13. They ran the teaser as soon as they knew they were ready, and got the final go-ahead for production. As soon as the C8 is announced and/or a similar teaser appears, I suspect GM will meet that target as well. Last edited by Foosh; 02-22-2019 at 10:40 AM. I am not buying the "major electrical issues" delays… way too many mules sitings to make me a believer. 24/48v systems are not too terribly complex regardless of the car’s features and functions. C8 is beyond ready to be released to the public and be made delivery available mid/late year. 9K C7’s on the ground is the issue. C8 release will absolutely pummel C7 inventory sales which will leave GM with a big problem on their hands in the board room and with their friendly dealers. A $5K incentive becomes a $45M problem. A $10K incentive becomes a $90M problem. All at a time when GM is battling for brand relevancy, models being nixed and layoffs. Imagine one going into the board room with Barra with this lovely problem. Yeah but they'll make that back 4X over selling every C8 they can make at MSRP. Memories here are very short. Back in 2017, GM had a similar large backlog exceeding a 200-day supply, but it was purposely done because the plant was closing for 4 months for a complete refurbishment, and they purposely built up enough supply to carry them through a long production hiatus. 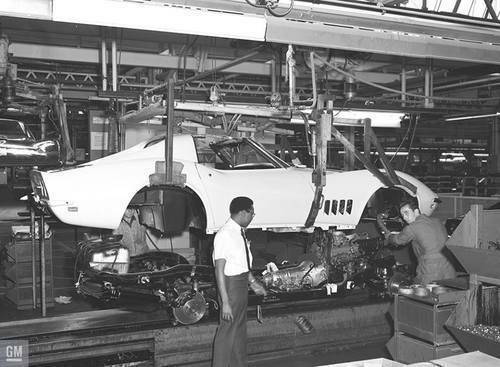 As the time neared for plant re-opening in November 2017, that's when GM added big incentives to clear remaining stock, and it was very effective in doing so. It is entirely possible something similar could be going on here in preparation for the changeover to C8 production. 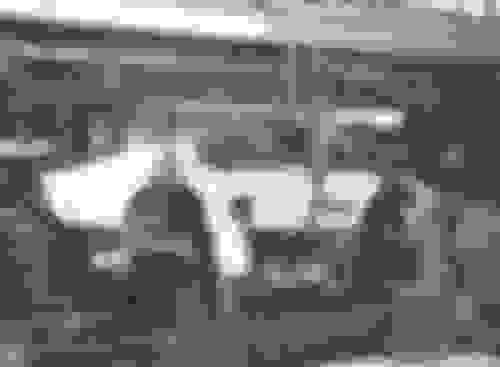 Last edited by Foosh; 02-22-2019 at 01:01 PM. The move to a 48V system combined with BorgWarner's mild modular hybrid system would introduce a lot of complexity. I doubt it's on the base car but it could be an optional performance package in the first year and it would fit with the tales of an unexpected surprise feature on the C8. Think of a Z69 mild hybrid package that simultaneously enhances both gas mileage and 0-30 performance. This would be distinct from the full hybrid Zora with the front electric drive motors in that the BorgWarner modules simply add torque at the crank. Alternatively they might have engineered a simple 48V electrical system but discovered it runs too close to current limits. Bean counters like cheap wiring harnesses so they could have pressured engineering to use wire gauges with less overhead capacity and then months later they discover a situation with all accessories running that puts it over the edge. It could even be something like heated seats pushing it over the edge - and the delay did happen at the onset of cold weather. Some of their buyers are this way too. Yep, as Foosh has eloquently stated multiple times, there is probably a delay in GM's internal scheduling, but as far as the public is concerned, there is no delay because the public has never been promised anything, Had GM came out last year and said the car would be ready in January, then didn't deliver in January, they'd look silly. Since they never said that, the only people who really care are a bunch of internet warriors who are trying to guess at a timeline based on plant tour availability. I am not buying the "major electrical issues" delays… way too many mules sitings to make me a believer. 24/48v systems are not too terribly complex regardless of the car’s features and functions. C8 is beyond ready to be released to the public and be made delivery available mid/late year. I'm guessing by that statement, you've never driven a mule. Just because it looks like a car and functionally drives on a public road, doesn't mean in any way it is ready for release. As far as electrical problems, that is a very vague term. It could be any number of things. I think I have stated in the past I was on a project where two separate components passed EMC testing individually, but the second you put them together as part of a complete system they blew up everytime you ran the test that they pass flawlessly on their own. Things don't always play together as expected when you plug them in for the first time as a system. Yes, it may be a simple fix engineering wise, but tooling and production wise it can take much longer. IN my case, the EE had the issue resolved in a day or two, and it took us something like two months to actually get new PCBs built, new connectors available, put the things together in a functioning ECU and verify the problem was solved, and that was on a rather unimportant comfort feature module. Last edited by jefnvk; 02-23-2019 at 02:36 PM. Yep... they sure do and I agree with you. It's been discussed many times on here. Compare the "How it's Made" show of the BG plant vs. Ferrari or Porsche and it's nuts. Many folks say "as long as the work output is good let people dress down". Many businesses do that, including the one I work for, these days... our official dress code is "dress how you feel is appropriate for the job" and we have over 5K emp. Personally, I'd like to see a dress code and I'd like to see assembly quality/consistency improve, but I won't derail another thread with a C7 panel gap and fit discussion I will say they dressed this way in the C5/6 days and the assembly quality was much better so it's really not the dress code. Yes... plant closed for the paint shop expansion. Plan was to re-open with reveal of C8. Evidence supporting that as a fact and not speculation please. I don't have any evidence other than what I was verbally told by people who have been accurate over the years about the C6 ZR1 back when the "blue devil" was a rumor and all of the C7 development. Just pickin with you, but let's face it, folks like Zerv got beat to **** saying things based on what they were told and without evidence supporting it. I personally believe the delay is due to a delay with the ME car, and can easily believe that the plan was to reopen the plant after it was released at Detroit or similar. But we should not state something as a fact without knowing it was a fact, and then chastise others for doing the same. Just saying we shouldn't have double standards. The double standards and ad hominem in this forum are really making it a drag to even read through the threads. (< not directing that at you, just stating the opinion in general). Last edited by vndkshn; 02-25-2019 at 11:28 AM. Discussion of rumors and interpretations of the slivers if info we have are all there is to talk about. To me, the whole point of this forum is to try to put together the puzzle of the car with the info at hand. What is it, when will it be, etc. I don't see harm in discussion things that are not 100% documented fact. It's OK to post opinion and then have the merits of it debated. Zerv was fine to post his thoughts that the car would be $169K, but it was also fine for forum members to call him a bozo and logically discuss why the Corvette team would be not going up market with the base car. My guess on that topic is the full-kill all-in Zora supercar with twin turbos and electric front drive will be $169K. Makes sense given the all-in ZR1 is $142K in 2019 dollars... assuming the car comes out in 4-5 more years after then do the normal Corvette release of "standard", Z06, ZR1 or... as some have said standard, Grand Sport, Grand Tour, then Zora. Agree. The Holy Grail of achieving a first pass design is still far from being achieved by any product development company in the world. Because of the delay it will now be called the C9.